Mosquitoes have plagued North America for nearly 100 million years. Every summer, they emerge from hibernation eager to attend our barbecues and pool parties. The result is too many mosquito bites and lots of calamine lotion to stop the itching. 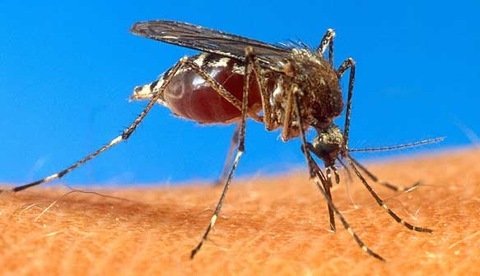 It’s not easy to outwit the hungry female mosquito, which needs our blood for protein to reproduce. The following tips however might make the battle a little easier to fight. First, mosquitoes are most prevalent at dusk and dawn, especially in warm humid weather. Try to wear long sleeves in a light fabric at those times. When dressing for a hot summer night, get out your white, khaki, olive and beige clothes. Mosquitoes are least attracted to those colors, but sporting an outfit in red, black, or a bright floral will lead to a mosquito attack. They also prefer biting the cooler skin of our extremities, so protecting ankles, feet and arms are the first line of defense. Certain strong odors alert mosquitoes that a host is near. If you’re already perspiring from the summer heat, expect to get bitten. Perfume or strongly scented shampoo, hairspray or body lotion serve as mosquito magnets; this is especially true if the fragrance is floral or fruity. And unlike us, smelly feet seem irresistible to them. 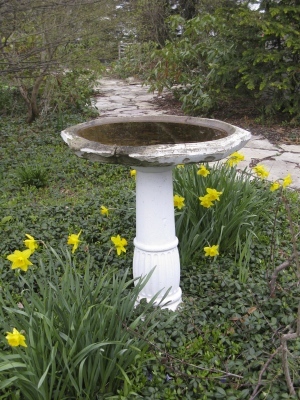 Don’t stand too close to birdbaths, ponds or watering cans that haven’t been emptied. Mosquitoes lay their eggs in stagnant water. The same rule applies to garages where mosquitoes love to hide. It’s also a mistake to sit near dark foliage. Mosquitoes will be resting in the shadows there, too. Instead spend your time near pots of marigolds, catnip or rosemary plants: all reportedly act as a natural repellent. Sipping iced tea or soda at the picnic might be wise. Research indicates that beer drinkers are more likely to be bitten. Ovulating women are also mosquito targets. In addition, blondes do not always have more fun; mosquitoes bite more blondes and redheads than they do brunettes. And don’t make too many sudden movements. 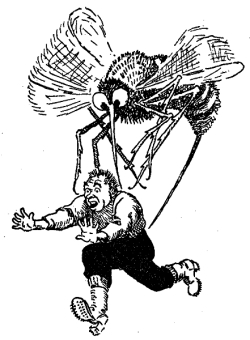 Waving your arms in an effort to chase off mosquitoes will only draw more of them your way. 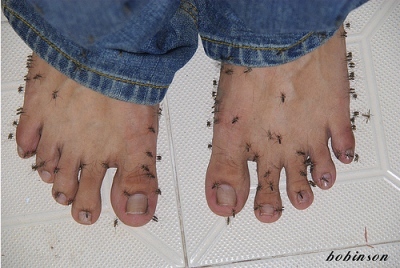 Luckily, mosquitoes aren’t the best fliers. An electric fan turned in your direction will make it more difficult for the mosquito to get to you. Also use fluorescent lights on the patio or sundeck; mosquitoes are attracted to incandescent bulbs. To really keep the mosquitoes away, there is no more potent weapon than DEET. For those reluctant to use such a strong chemical, research shows the next best thing is lemon eucalyptus oil. Look for insect sprays that feature this oil in their product. Other natural mosquito repellents -- which are more effective on some people than others -- include Vitamin B supplements, tea tree oil, garlic and Neem oil. Never put insect repellent underneath clothing, wash it off before going to bed, and read the instructions carefully before applying on children. Finally don’t waste money on those bug zappers; they kill a lot of insects but rarely are they female mosquitoes. Following these simple guidelines should result in fewer mosquito bites this summer. So wear white, omit the perfume, and plant marigolds. But keep the calamine lotion handy….just in case.